Sonja looks pretty in this old dress... and very PINK... But the Photos are beautiful anyway! Beautiful couple! I really do not like this pink dress. The material seems so stiff and outdated. On the other hand, I think that the blue one is stunning, and she looks much more personable in that dress. Her Majesty looks stunning. That blue dress really flatters her and I can't believe she's 70. I actually like the pink frock. It's quite dramatic and very Zsa Zsa. The second Portrait is much better then the first one. The backround is so much better (the blue backround in the first portraits is so.. cold!). 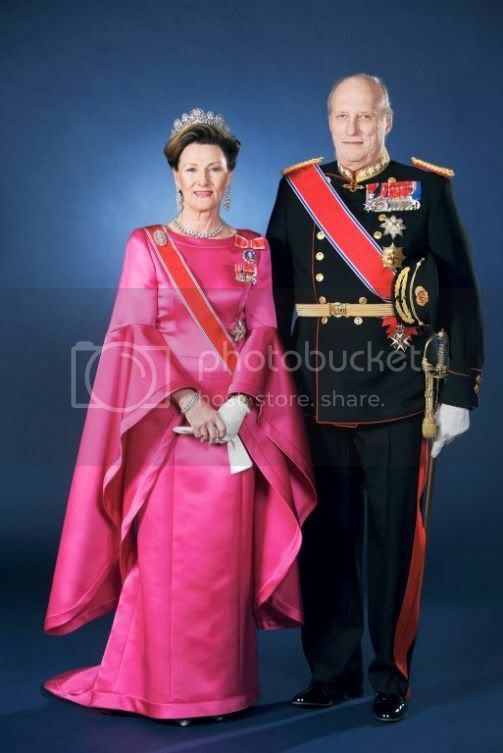 Sonja looks really pretty and the King looks much healthier in this picture. The "pinK" portrait is nice, too... but as I said: I don't really like the backround and the King looks rather sick. Sonja's pink wings are great!